The 64 x 19-ft. Defiant-class mono-hull pilot boat arrived two weeks ago and will be christened at a ceremony on Jan. 31. It was designed by Metal Shark and built at the company's Franklin, La. shipyard. 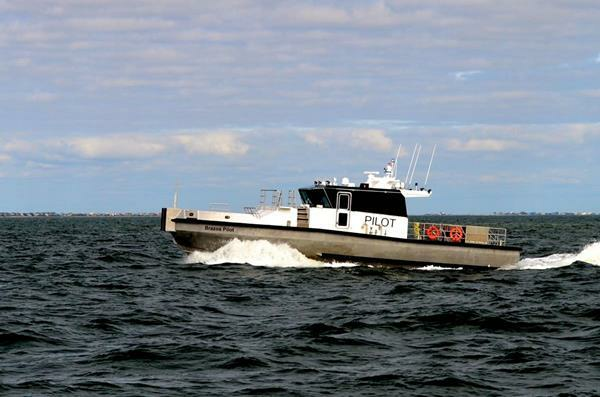 The $2.5 million new pilot boat is intended to replace the pilots' smaller pilot boat, the "Freeport Pilot, a 36-year-old 45-foot, single screw, mono-hull vessel with less than 400-hp, as well as improve safety for crews while enhancing service to operators and provide around-the-clock service at Port Freeport. "Our port and the maritime industry have changed, grown and evolved over the last four decades in ways we could not have imagined then. So has the mission requirements of our pilot boats. The "Freeport Pilot" was never designed to do what we require out of a pilot boat today. The "Freeport Pilot" has served our port well over the last 36 years and we will all miss her. She has earned a good retirement." The "Brazos Pilot" is 20 feet longer, 6 feet wider, almost three times heavier, and has triple the horsepower than its predecessor. To compare the two boats is like comparing a 1920 Ford Model T with a 2019 Ford F-250, Burns said. "The (20 feet) in additional length gives us better sea keeping ability, the additional six-feet in width gives us better stability, the additional weight handles the seas better and the increased horsepower gives us greater safety when boarding the largest most powerful ships on the ocean," he said. 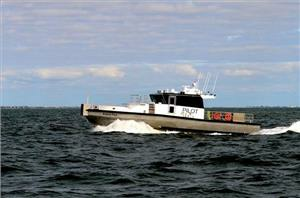 Burns said the new pilot boat was not designed for speed. "Although nice to have, our real design criterion was the ability of the boat to break powerful suctions that large ships generate near their stern," he said. "These suctions are very dangerous to pilot boats and many pilot boats have been sunk because they lacked the power to break away from the ship." He also said the boat's larger and wider design was designed with a specific purpose. For example, the gunnels are raised, the bow flare is deeper and the freeboard is taller, allowing the boat to operate in heavier seas than their current vessels. The wheelhouse is also purposely larger, with a 360-degree visibility and unobstructed views in every direction. "Parts of the ceiling is glass so the boat operator can see pilots on the ship as they descend down the pilot ladder. The forward windows are slanted out to reduce glare and heating coils inside the glass prevent any condensation from obstructing the boat operator's view," Burns said. The seats are designed to hold passengers securely in bad weather "so you don't fly out of your chair every time you hit a large wave," Burns said. "We designed the boat to accommodate a two-man crew. The boat it's replacing was only designed for a crew of one," Burns said. "Night operations have always been more dangerous. If a pilot were lost in the water the boat could only use spot lights to find him. Now using the FLIR camera you can spot a man in the water at night from two miles away," he said.